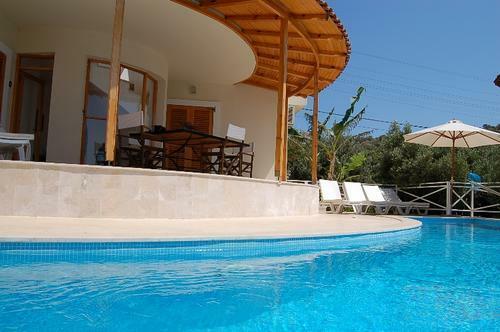 Luxury Vacation or Holiday Rental Villa Let with Private Pool in Antiphellos, Kas, Antalya, Turkey. Late Deals, Special Offers. Luxury Villa Artemis with private pool & stunning sea views. Vacation rental. Luxury Villa Artemis, with stunning Mediterranean Sea & mountain views & private infinity pool in a tropical garden setting, on the exclusive Kas Peninsula, Turkey. The villa offers a high standard of stylishly furnished & equipped accommodation which includes use of a computer with free ADSL broadband connection. This spacious contemporary villa is ideally located on the lagoon side of the Kas Peninsula on Turkey's beautiful Mediterranean coast & is just a few minutes drive from the charming up-market harbour side resort of Kas. with it�s many excellent bars, restaurants, shops, sailing & water sports & diving facilities. � 1 further double bedroom & 1-twin bedroom. local telephone calls, safe, book & DVD collection..
� Guest bathroom with wc, hand basin and shower cabin. � No smoking permitted inside the villa, no pets permitted. The charming and friendly resort of Kas is just a 1/2hr drive from Kalkan, along one of the most dramatic and beautiful coastal roads in the Mediterranean. Cradled by the Taurus Mountains, with over 300 days of sunshine, very low humidity, and warm crystal clear unpolluted sea, modern day Kas, with its cobbled streets, is built on the ancient site of Antiphellos. An up-market resort with international appeal, that attracts professionals, artists, writers,divers and the yachting fraternity, Kas is open all year round. It has 2 marinas, and many excellent restaurants, bars, and antique, jewelry, carpet and designer clothes shops. However, Kas is much more than just a resort, with a resident population of 8,000 people, it services the banking and legal needs of the region. It also boasts its own small hospital, school, and some excellent multi-lingual doctors and dentists. With its own amphitheatre, and close to numerous historic, and un-spoilt areas of undeniable natural beauty, Kas offers an excellent quality of life and is an ideal location for a holiday in the sun, you can even swim with dolphins & white whales. The Villa is just 3klm's from the centre of Kas with an 1/2 hourly Dolmus service from early morning until midnight.Taxis are also available, and boats run out daily from the harbour to the many bays and small islands surrounding Kas. Price Includes:-25% of total tariff payable on making reservation, balance plus refunable security deposit of �350 payable 10 weeks prior to arrival at the villa. All reservations made within 10 weeks prior to arrival date must be paid in full. Prices quoted are for upto 6 persons + 1 baby and include all bedlinen,hand and bath towels,bathrobes, beach/bathing towels, weekly clening & linen change, daily refuse collection & pool clean. free local calls, all utilities and welcome pack of local produce on arrival. Fresh bread delivery each morning at cost. Additional information IS available on request. 1 weeks free car rental of A/c Toyota Corolla included in 2 week bookings in July & August. Complementary transfers for all 2 week bookings in 1st June - 30th September 2008. Guests must vacate the villa by 11.00hrs unless otherwise agreed in writing. Price Excludes:-Flights,Airport transfers in low season,and holiday insurance. Other Information:-Competively priced Airport and car hire packages available. The Villa will accomodate upto 6 persons. Cot & highchair, baby car seat and child booster seat available on request.Cooking,additional cleaning, laundry & ironing service available for additional charge. Barbecue evening, meal preparation & service, shopping available for additional charge. Private gulet charter can be arranged.